'Mr. Thomas is back again to scare the sh*t out of you. Fear not though, as it's not all blood, guts, and gore. There are sincere, heart warming moments that unfold within the pages of "Succubus" but the dread lingers and surrounds you. Things do get messy and violent but not just for the sake of being violent. The author crafts a wonderful plot that isn't hinged on gore. Remove the violence and it would still be an intense story well worth reading. I believe Mr. Thomas is stalking me. His stories consistently have elements that terrify me in real life. And within the pages of his fiction, he amps everything up that causes adrenaline to pump and nerves to rattle. 'Laura passes up the traditional spooks and trick or treating and instead decides to babysit on Halloween night. The money proves to be too alluring as she takes on the job of watching the son of a wealthy family. Her Halloween night turns from ordinary to deadly when a creepy clown stalks throughout the castle. Wesley Thomas has gotten into a groove and releases another spine tingling short story. I've had the pleasure of reading all of his work to date(I'm pretty sure lol) and each release seems Laura passes up the traditional spooks and trick or treating and instead decides to babysit on Halloween night. The money proves to be too alluring as she takes on the job of watching the son of a wealthy family. Her Halloween night turns from ordinary to deadly when a creepy clown stalks throughout the castle. Wesley Thomas has gotten into a groove and releases another spine tingling short story. I've had the pleasure of reading all of his work to date(I'm pretty sure lol) and each release seems to top the previous one. 'A fast paced, gripping, thrilling, horrifying tale. The main character is excellently portrayed, I love how her struggles create a more realistic person. I also love that the writer has been clever and intertwined a scary plot with a serious issue that is unfortunately still common in today's society. This is the first book whereby I have been actually scared by words, several times through the novel I was breaking out in goosebumps reading at night by my lamp, it was great. This is my favorite read so far, a descriptive writing style which is unlike any other writer I have experienced. His writing style in parts is quite poetic, but how he captures a location, or how a character is feeling is uncanny. 'Wow! What a nice collection of short stories. This is a mixed bag of entertainment; some are dark, some are creepy, and others downright chilling! Over the past couple of years I have watched as Wesley has grown in his telling of tales. His stories have taken a more sinister turn and you, reader of horror, benefit greatly from this. Think “Goosebumps” on steroids. Oh, and don’t let the deceptive prose fool you; the words may at times sound sweet but that’s just to mask the arsenic! 'Wesley Thomas has come up with a novel idea (yes, pun intended) he has put together a macabre collection of stories based on urban legends from the UK, the first of said Frightful Tales is Rose’s Thorn. Emily and Declan met in the maternity ward where they were born 11 years ago, they’ve been the best of friends ever since. Declan lives with a loving mother and an alcoholic father who struggles to make ends meet. Emily’s family comes from wealth but somehow the opposite backgrounds have not made a difference in their friendship. One Christmas Emily gifts Declan with a porcelain doll from her collection and that is he beginning of Declan’s woes. They say the soul lives forever, but what happens when it lives inside a porcelain doll? Declan has to hide the doll named Rose under his floorboards lest his father finds her and punishes Declan for playing with dolls. At first when Rose starts appearing outside her hiding place, Declan is mystified. After numerous attempts to keep her hidden, he becomes frightened. He begins to have strange dreams and visions of unspeakable horror. At last too terrified to continue on alone he confides in his mother, hoping to make sense of the madness. He just wants Rose to go away! '​I've reviewed this author's previous works before and with each new release his talent surpasses the last. "What Goes Bump In The Night?" continues his rise as this collection includes a whopping sixteen stories for readers to enjoy. I've said it before but I love collections like this because it gives the readers an assortment of different styles, plots, and characters to read. All these tales were good and kept me entertained but three really stood out as my favorites. In 'A Jogger's Nightmare' the author unleashes his most disturbing and disgusting story that had my inner gore-hound screaming for more. In 'Clown Karma' a thief's midnight caper goes wrong in show many ways. It also showcases the author's ability to weave different genres together. 'The Gaming Addict' really left me nerve wracked and skittish. Being a gamer, this story really sucked me in. Sixteen stories and sneak peek of the upcoming "Frightful Tales: Book Two- He's Watching You" are included and well worth the price. I'm sure every reader will find a story they love. 'I was rather impressed! 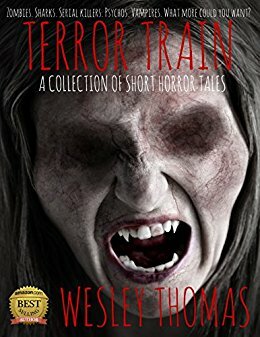 Terror Train is a collection of six short stories, all with an edge you don’t expect. The first story, The Miracle of Death is about a brother and sister trying to survive the apocalypse. Enduring a series of misfortunes they are finally rescued, only to find there is no such thing as a happy ending. Child’s Play is anything but….find out what happens when three boys decide to see just what is secreted away in old farmer McCall’s barn. In An Odyssey of Terror we meet a young girl waking from one nightmare, only to find herself in another. Kane is an abusive alcoholic husband and father. When his family finally summons the courage to leave, they find out that you can Never Turn Around. A Valentine’s Horror, aah the lengths one will go to, to find true love. I Do What I Do is the story of a pathetic man who finds pleasure in others’ horror, but remember what you do may come back to haunt you.